Online course access. Any time, anywhere. On-Demand access to all courseware. Nothing to download. "I got my RCV certification last week. The online classes and material were concise and very clear. It feels great to get certified in a week without using any extra material." "I just finished the RCV, SOA , PPO and MALC courses online and wanted to say thanks for the great material, practices, quizes and practice exams. I was able to get through my 3 remaining intermediate courses and the MALC in 6 weeks and passed the exam for each one on the first try with no problems." "The online courses were very helpful in enabling me to obtain my ITIL Expert Certification quickly without sacrificing quality. The online courses were informative, very focused on helping understanding, and very convenient. The staff was friendly and attentive to helping me through the process." "I completed the 5 Lifecycle exams and MALC using their online self-paced products. Feels good to add 'ITIL Expert' to my resume." "I just completed the ITIL Online Training Course and found it to be outstanding. The presenter and supporting material were excellent." "The instructional videos were informative, very focused on helping understanding, and very convenient. The whole team was very friendly and attentive to helping me through the process." "The instructor was phenomenal. I enrolled in the ITIL Bootcamp Course on July 12th and it was wonderful because I could take the course at my convenience." "I found this on-demand teaching approach, with visual aids and content organization to be far above other online programs. The work aids, and interactive quizzes were exceptional in preparing me for my exam. I passed on the first attempt!" "The online software is very well organized and easy to maneuver around to the different topics. The lecturer was very engaging and held my interest throughout the entire program. Because of this online Bootcamp, the manual and the study guide, plus the excellent way the information was presented, I was able to score well and easily pass the exam." This Service Strategy (SS) Lifecycle course provides a comprehensive study of the ITIL® phase of Service Strategy, and where it fits into the greater Service Lifecycle. This self-paced course is available online for a 90 day access period and includes 21 hours of interactive courseware, all student materials, access to live instructors, 3 ITIL Credits, and 22 PDU Credits. Instant email confirmation, allow 1 business day for course access. Class accredited by AXELOS, PEOPLECERT, and PMI. The Service Design (SD) Lifecycle course provides a comprehensive study of the ITIL® phase of Service Design and where it fits into the greater Service Lifecycle. This self-paced course is available online for a 90 day access period and includes 21 hours of interactive courseware, all student materials, access to live instructors, 3 ITIL Credits, and 22 PDU Credits. Instant email confirmation, allow 1 business day for course access. Class accredited by AXELOS, PEOPLECERT, and PMI. The Service Transition (ST) Lifecycle course provides a comprehensive study of the ITIL® phase of Service Transition and where it fits into the greater Service Lifecycle. This self-paced course is available online for a 90 day access period and includes 21 hours of interactive courseware, all student materials, access to live instructors, 3 ITIL Credits, and 22 PDU Credits. Instant email confirmation, allow 1 business day for course access. Class accredited by AXELOS, PEOPLECERT, and PMI. 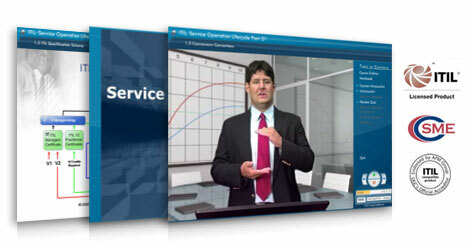 The Service Operation (SO) Lifecycle course provides a comprehensive study of the ITIL® phase of Service Operation and where it fits into the greater Service Lifecycle. This self-paced course is available online for a 90 day access period and includes 21 hours of interactive courseware, all student materials, access to live instructors, 3 ITIL Credits, and 22 PDU Credits. Instant email confirmation, allow 1 business day for course access. Class accredited by AXELOS, PEOPLECERT, and PMI. Coordinate and carry out the actions and processes required to deliver and manage services at agreed levels to business users and customers as well as the responsibility for the ongoing management of the technology that is used to deliver and support services. The Continual Service Improvement (CSI) Lifecycle course provides a comprehensive study of Continual Service Improvement and how it is applied across the greater Service Lifecycle. This self-paced course is available online for a 90 day access period and includes 21 hours of interactive courseware, all student materials, access to live instructors, 3 ITIL Credits, and 22 PDU Credits. Instant email confirmation, allow 1 business day for course access. Class accredited by AXELOS, PEOPLECERT, and PMI. This PEOPLECERT/AXELOS accredited training program is for individuals seeking specialist certification in ITIL's Continual Service Improvement practice area. Candidates for this program include executives, managers, supervisory staff, team leaders, architects and planners who hold a Foundation certificate. Candidates will gain competencies in the following areas upon successful completion of the reading (Continual Service Improvement Book), training and examination components related to this certification. This interactive online course immerses learners in the practical aspects of the ITIL® Service Lifecycle and processes associated with the Operational Support and Analysis (OSA) of services and service delivery. This self-paced course is available online for a 90 day access period and includes 30 hours of interactive courseware, all student materials, access to live instructors, 4 ITIL Credits, and 38 PDU Credits. Instant email confirmation, allow 1 business day for course access. Class accredited by AXELOS, PEOPLECERT, and PMI. This PEOPLECERT/AXELOS accredited training program is for individuals seeking specialist certification in ITIL's Operational Support & Analysis practice area. Candidates for this program include implementation and operation specialist who hold a Foundation certificate. Candidates will gain competencies in the following areas upon successful completion of the reading (Service Operation Book), training and examination components related to this certification. This interactive online course immerses learners in the practical aspects of the ITIL® Service Lifecycle and processes associated with the Release, Control and Validation (RCV) of services and service delivery. This self-paced course is available online for a 90 day access period and includes 30 hours of interactive courseware, all student materials, access to live instructors, 4 ITIL Credits, and 38 PDU Credits. Instant email confirmation, allow 1 business day for course access. Class accredited by AXELOS, PEOPLECERT, and PMI. This PEOPLECERT/AXELOS accredited training program is for individuals seeking specialist certification in ITIL's Release, Control & Validation practice area. Candidates for this program include implementation and operation specialist who hold a Foundation certificate. Candidates will gain competencies in the following areas upon successful completion of the reading (Service Operation & Transition Books), training and examination components related to this certification. This interactive online course immerses learners in the practical aspects of the ITIL® Service Lifecycle and processes associated with the Service Offerings and Agreements (SOA) of services and service delivery. This self-paced course is available online for a 90 day access period and includes 30 hours of interactive courseware, all student materials, access to live instructors, 4 ITIL Credits, and 38 PDU Credits. Instant email confirmation, allow 1 business day for course access. Class accredited by AXELOS, PEOPLECERT, and PMI. This PEOPLECERT/AXELOS accredited training program is for individuals seeking specialist certification in ITIL's Service Offerings & Agreements (SOA) practice area. Candidates for this program include implementation and operation specialist who hold a Foundation certificate. Candidates will gain competencies in the following areas upon successful completion of the reading (Service Strategy & Service Design Books), training and examination components related to this certification. This interactive online course immerses learners in the practical aspects of the ITIL® Service Lifecycle and processes associated with Planning, Protection and Optimization (PPO) which ensures IT departments can cost-effectively manage customer demand, availability and capacity while mitigating risk. This self-paced course is available online for a 90 day access period and includes 30 hours of interactive courseware, all student materials, access to live instructors, 4 ITIL Credits, and 38 PDU Credits. Instant email confirmation, allow 1 business day for course access. Class accredited by AXELOS, PEOPLECERT, and PMI. This PEOPLECERT/AXELOS accredited training program is for individuals seeking specialist certification in ITIL's Planning, Protection & Optimization practice area. Candidates for this program include implementation and operation specialist who hold a Foundation certificate. Candidates will gain competencies in the following areas upon successful completion of the reading (Service Strategy & Service Design Books), training and examination components related to this certification. This interactive online course for ITIL Intermediate - Managing Across the Lifecycle (MALC) focuses on the ancillary knowledge required to implement and manage the necessary skills in IT Service Management. This self-paced course is available online for a 90 day access period and includes 30 hours of interactive courseware, all student materials, access to live instructors, 5 ITIL Credits, and 38 PDU Credits. Instant email confirmation, allow 1 business day for course access. Class accredited by AXELOS, PEOPLECERT, and PMI. This PEOPLECERT/AXELOS accredited training program is for individuals seeking to take the final class to ITIL Expert. Candidates for this class must already hold the ITIL Foundation Certificate plus have obtained a further 15 credits from the ITIL Service Lifecycle track, the ITIL Service Capability track or a balanced selection from both ITIL Service Lifecycle and Service Capability qualifications.Documentary evidence of this must be presented to gain admission to this certification level. Candidates will gain competencies in the following areas upon successful completion of the reading (the 5 books of the ITIL Library), training and examination components related to this certification. "The online courses were very helpful in enabling me to obtain my ITIL Expert Certification quickly without sacrificing quality..."
This Service Strategy (SS) Lifecycle course provides a comprehensive study of the ITIL® phase of Service Strategy, and where it fits into the greater Service Lifecycle. This self-paced course is available online for a 90 day access period and includes 21 hours of interactive courseware, all student materials, access to live instructors, 3 ITIL Credits, and 22 PDU Credits. Instant email confirmation, allow 1 business day for course access. Class accredited by APMG, CSME, and PMI. If you plan to take the exam after your ITIL Service Strategy (SS) Certification Course, you may add the exam voucher to your order now. The Service Design (SD) Lifecycle course provides a comprehensive study of the ITIL® phase of Service Design and where it fits into the greater Service Lifecycle. This self-paced course is available online for a 90 day access period and includes 21 hours of interactive courseware, all student materials, access to live instructors, 3 ITIL Credits, and 22 PDU Credits. Instant email confirmation, allow 1 business day for course access. Class accredited by APMG, CSME, and PMI. If you plan to take the exam after your ITIL Service Design (SD) Certification Course, you may add the exam voucher to your order now. The Service Transition (ST) Lifecycle course provides a comprehensive study of the ITIL® phase of Service Transition and where it fits into the greater Service Lifecycle. This self-paced course is available online for a 90 day access period and includes 21 hours of interactive courseware, all student materials, access to live instructors, 3 ITIL Credits, and 22 PDU Credits. Instant email confirmation, allow 1 business day for course access. Class accredited by APMG, CSME, and PMI. If you plan to take the exam after your ITIL Service Transition (ST) Certification Course, you may add the exam voucher to your order now. The Service Operation (SO) Lifecycle course provides a comprehensive study of the ITIL® phase of Service Operation and where it fits into the greater Service Lifecycle. This self-paced course is available online for a 90 day access period and includes 21 hours of interactive courseware, all student materials, access to live instructors, 3 ITIL Credits, and 22 PDU Credits. Instant email confirmation, allow 1 business day for course access. Class accredited by APMG, CSME, and PMI. If you plan to take the exam after your ITIL Service Operation (SO) Certification Course, you may add the exam voucher to your order now. The Continual Service Improvement (CSI) Lifecycle course provides a comprehensive study of Continual Service Improvement and how it is applied across the greater Service Lifecycle. This self-paced course is available online for a 90 day access period and includes 21 hours of interactive courseware, all student materials, access to live instructors, 3 ITIL Credits, and 22 PDU Credits. Instant email confirmation, allow 1 business day for course access. Class accredited by APMG, CSME, and PMI. This CSME/APMG accredited training program is for individuals seeking specialist certification in ITIL's Continual Service Improvement practice area. Candidates for this program include executives, managers, supervisory staff, team leaders, architects and planners who hold a Foundation certificate. Candidates will gain competencies in the following areas upon successful completion of the reading (Continual Service Improvement Book), training and examination components related to this certification. If you plan to take the exam after your ITIL Continual Service Improvement (CSI) Certification Course, you may add the exam voucher to your order now. This interactive online course immerses learners in the practical aspects of the ITIL® Service Lifecycle and processes associated with the Operational Support and Analysis (OSA) of services and service delivery. This self-paced course is available online for a 90 day access period and includes 30 hours of interactive courseware, all student materials, access to live instructors, 4 ITIL Credits, and 38 PDU Credits. Instant email confirmation, allow 1 business day for course access. Class accredited by APMG, CSME, and PMI. This CSME/APMG accredited training program is for individuals seeking specialist certification in ITIL's Operational Support & Analysis practice area. Candidates for this program include implementation and operation specialist who hold a Foundation certificate. Candidates will gain competencies in the following areas upon successful completion of the reading (Service Operation Book), training and examination components related to this certification. If you plan to take the exam after your ITIL Operational Support & Analysis (OSA) Certification Course, you may add the exam voucher to your order now. This interactive online course immerses learners in the practical aspects of the ITIL® Service Lifecycle and processes associated with the Release, Control and Validation (RCV) of services and service delivery. This self-paced course is available online for a 90 day access period and includes 30 hours of interactive courseware, all student materials, access to live instructors, 4 ITIL Credits, and 38 PDU Credits. Instant email confirmation, allow 1 business day for course access. Class accredited by APMG, CSME, and PMI. This CSME/APMG accredited training program is for individuals seeking specialist certification in ITIL's Release, Control & Validation practice area. Candidates for this program include implementation and operation specialist who hold a Foundation certificate. Candidates will gain competencies in the following areas upon successful completion of the reading (Service Operation & Transition Books), training and examination components related to this certification. If you plan to take the exam after your ITIL Release Control & Validation (RCV) Certification Course, you may add the exam voucher to your order now. This interactive online course immerses learners in the practical aspects of the ITIL® Service Lifecycle and processes associated with the Service Offerings and Agreements (SOA) of services and service delivery. This self-paced course is available online for a 90 day access period and includes 30 hours of interactive courseware, all student materials, access to live instructors, 4 ITIL Credits, and 38 PDU Credits. Instant email confirmation, allow 1 business day for course access. Class accredited by APMG, CSME, and PMI. This CSME/APMG accredited training program is for individuals seeking specialist certification in ITIL's Service Offerings & Agreements practice area. Candidates for this program include implementation and operation specialist who hold a Foundation certificate. Candidates will gain competencies in the following areas upon successful completion of the reading (Service Strategy & Service Design Books), training and examination components related to this certification. If you plan to take the exam after your ITIL Service Offerings & Agreements (SOA) Certification Course, you may add the exam voucher to your order now. This interactive online course immerses learners in the practical aspects of the ITIL® Service Lifecycle and processes associated with Planning, Protection and Optimization (PPO) which ensures IT departments can cost-effectively manage customer demand, availability and capacity while mitigating risk. This self-paced course is available online for a 90 day access period and includes 30 hours of interactive courseware, all student materials, access to live instructors, 4 ITIL Credits, and 38 PDU Credits. Instant email confirmation, allow 1 business day for course access. Class accredited by APMG, CSME, and PMI. This CSME/APMG accredited training program is for individuals seeking specialist certification in ITIL's Planning, Protection & Optimization practice area. Candidates for this program include implementation and operation specialist who hold a Foundation certificate. Candidates will gain competencies in the following areas upon successful completion of the reading (Service Strategy & Service Design Books), training and examination components related to this certification. If you plan to take the exam after your ITIL Planning, Protection & Optimization (PPO) Certification Course, you may add the exam voucher to your order now. This interactive online course for ITIL Intermediate - Managing Across the Lifecycle (MALC) focuses on the ancillary knowledge required to implement and manage the necessary skills in IT Service Management. This self-paced course is available online for a 90 day access period and includes 30 hours of interactive courseware, all student materials, access to live instructors, 5 ITIL Credits, and 38 PDU Credits. Instant email confirmation, allow 1 business day for course access. Class accredited by APMG, CSME, and PMI. This CSME/APMG accredited training program is for individuals seeking to take the final class to ITIL Expert. Candidates for this class must already hold the ITIL Foundation Certificate plus have obtained a further 15 credits from the ITIL Service Lifecycle track, the ITIL Service Capability track or a balanced selection from both ITIL Service Lifecycle and Service Capability qualifications.Documentary evidence of this must be presented to gain admission to this certification level. Candidates will gain competencies in the following areas upon successful completion of the reading (the 5 books of the ITIL Library), training and examination components related to this certification. If you plan to take the exam after your ITIL Managing Across the Lifecycle (MALC) Certification Course, you may add the exam voucher to your order now. All ITIL Intermediate courses are fully accredited by AXELOS and PEOPLECERT, benchmarks for quality in the field of ITIL and IT Service Management (ITSM). In addition, our courses are preapproved for PDU credits by the Project Management Institute (PMI). 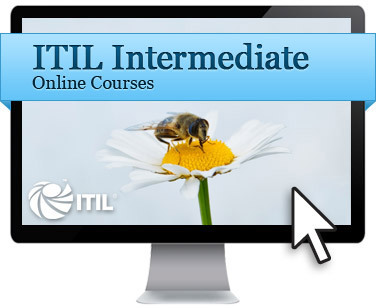 Every ITIL Intermediate course contains over 18 hours of instructor sessions designed for On-Demand, self paced learning. Students may complete the entire curriculum in order, or re-visit course sessions as many times as needed with limit. Students receive access to our premium ITIL instructor community who will answer in-depth ITIL questions. Access to our ITIL Experts are provided to all students enrolled in an ITIL Intermediate course. ITIL quizzes are provided following each interactive lesson to reinforce ITIL topics and test knowledge. In addition, two official ITIL sample mock exams are provided at the end of each course. A detailed ITIL Study Guide is included as a supplement with every course. Each ITIL Study Guide summarizes the course sessions, focusing on key ITIL concepts from each ITIL Intermediate subject matter. An exhaustive student course manual covers all content from the selected ITIL Intermediate course. The course manual provides an alternative to interactive presentations, allowing students to quickly access information in an electronic book format.